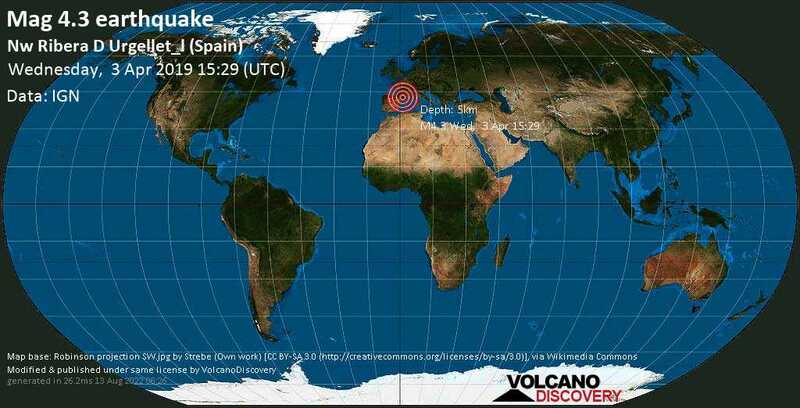 There was an earthquake near Andorra a few days ago. It was described as the strongest earthquake of this century for the region with 4.5 in the scale of Richter. Not a big one, but the region has been relatively calm during the past century or so. Detailed earthquake information - overview map, magnitude, time, depth, information source, shake map, list of reports. Feature interactive map: submit / read I-felt-an-earthquake reports and links to further info. MOSCOW, April 10. /TASS/. /TASS/. An earthquake of 5.0 magnitude has been registered in Taiwan, US Geological Survey reported on Tuesday. The earthquake's epicenter lay in 3 km to the south-west from the city of Hualien at the depth of 10 km. According to a local central weather bureau, Taipei area has been rocked by some 4-magnitude quake. There have been no immediate reports of casualties or damage to the buildings so far. According to the US Geological Survey, a strong 6.4-magnitude earthquake has rocked eastern Taiwan. A 6.1-magnitude quake was registered in the Hualien County on the eastern coast of Taiwan, the China Earthquake Networks Center (CENC) said on Thursday. All subway services have been temporarily suspended in Taipei due to the earthquake, local media reported. The quake measures 4 magnitude in the Taipei. The seismological activity took place at about 1 p.m. local time (05:00 GMT) at the depth of about 50 kilometers (31 miles). There have been no immediate reports of damage or injuries as a result of the quake.